With Mulberry Lane Farm covering over 123 acres, capacity is limitless. Use of the 4000 square foot Haymow, the lower Dairy Barn & rustic Black Smith Shop, along with acres of manicured lawns, wedding size shouldn't be a concern. The 200 capacity guideline in the Haymow is for a formal sit down meal and buffet line within the barn. The Haymow can seat 250 guests by hosting a non-buffet meal (plated or family style meal) or by placing the buffet line outside the barn. If your guest list is over 250 we recommend a more informal meal utilizing the entire farm. An informal heavy hor o'deurve style meal or casual meal utilizing our outdoor picnic tables are creative options. 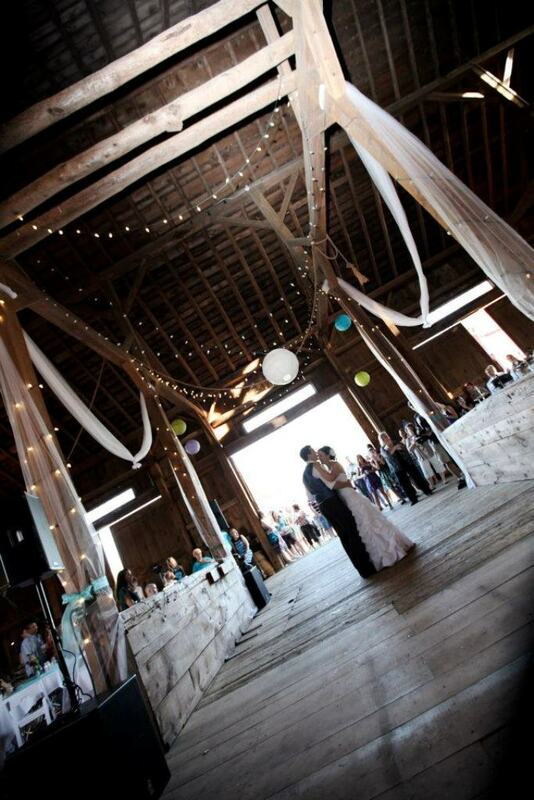 Some wedding couples have done little to no additional decorating to the farm's country decor, beautifully strung lights, and mason jar chandelier. Their desire was to have a true farm setting. Some have elected to decorate with lace, burlap, ball jars etc. for a shabby chic look. To ensure a personal wedding that reflects each bride and groom, Mulberry Lane Farm provides 7 linen tablecloth colors and 26 linen napkin colors to choose from. To continue that personal touch, the couple is responsible for the setting of tables & your centerpieces.